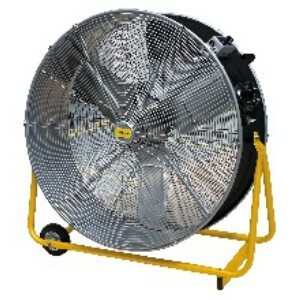 Blade Size: 30"", 2 Speed Settings, Electrical Input: 240v 50Hz, Fuse Rating (A): 3, "
"A three blade drum fan in metal finish. Multi directional dispersion of air by with 360 degree adjustment. With its tilt able control positions, 240v input and 2 speed fan adjustments this fan works out to be a very powerful drum fan. Specification: Air Displacement: 16,800 m3/h, Blade Size: 30"", 2 Speed Settings, Electrical Input: 240v 50Hz, Fuse Rating (A): 3, "